A very good method of growing individual strawberry plants that will produce large clean berries is to provide a covering constructed from a board 10 in. square with a 3-in. hole bored in the center. 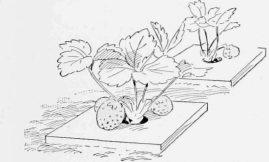 This covering is placed over the plant, as shown in the sketch, to keep down weeds, retain moisture, and to make a base for the ripening berries. A shower cannot spatter dirt and sand on the growing fruit. The rays of the sun beating on the surface of the board will aid in the ripening. If a log can be obtained, the boards can be made better and more quickly. Disks about 1 in. thick are sawed from the log and holes in their centers either cut with a chisel or bored, as desired.